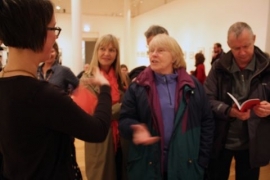 A blog set up to track the course of an a-n Re:view bursary in 2013, revisited in 2018 to reflect on Manifesta 12 biennial. The first news bulletin I watch on my return from visiting Manifesta 12 in Parlermo includes an item on the separation of migrant children from their parents at the U.S. Mexico border and a report of statements by Italy’s interior minister on his wish to create a census for the country’s Roma population. Both before and after my trip, Italy’s responses to migrant vessels in the Mediterranean (first closing their ports to rescue boats, then threating to impound NGO rescue ships) is never far from the news. These actualities sit in stark contrast to Leoluca Orlando’s ambitions [above] for a borderless world. We live in perilous times; perilous in particular for people who are non-white, non-western and compelled to travel to seek safety, work or a better life. For people like me, with privilege – born somewhere stable with many advantages – the seemingly constant stream of desolate stories is saddening, anxious-making and paralysing even. It’s easy to feel powerless, to feel a push-pull between watching the bigotry unfold on screen, and turning away and ignoring events that seem impossible to grasp or change. When in Palermo (thanks to an a-n bursary) and with my i-phone on its last legs (battery conservation required) I revelled in time away from the news-cycle. I was a tourist; there was some frivolity – with art, sun, friends, food and wine. At the same time, what the biennial offered me was space and opportunity to consider the potential role of art in responding to current politics. How might the specific materials and contexts that artists have available to them help make the world a more welcoming place? A question that kept occurring to me was: how is it possible to adequately represent migration in art, and what’s the purpose of doing this? Whilst the biennial gives no definitive answers this many of its exhibiting artists seem to be grappling with this question. I want to try and explore it a bit more through specific, example works. First though, I will provide a bit of orientation. If you’re reading this and planning to go to Manifesta soon, then what you probably really want to know is: ‘What’s it all about?’ and: ‘What’s worth looking at?’ If you simply want a bit of an overview of what the biennial is and what’s included (and what some of my favourites were) then read Part 2 below. If you want to read my tentative thoughts on how the artists represent migration, then head to Part 3. A second approach was to imagine or posit an alternative, borderless world. Here the ‘garden’ metaphor that provides Manifesta’s central motif was key and most of these works came under the strand ‘Garden of Flows.’ An example here is Fallen Fruit’s ‘Theatre of the Sun.’ Based on the idea that seeds move freely – on the wind or carried in clothing or cargo – Fallen Fruit’s spectacular, multi-coloured wallpaper images Palermo’s fruits. Alongside this ‘The Public Fruit Map of Palermo’ shows the location of hundreds of fruit trees in the city, as part of an expanding, global resource mapping edible fruits. 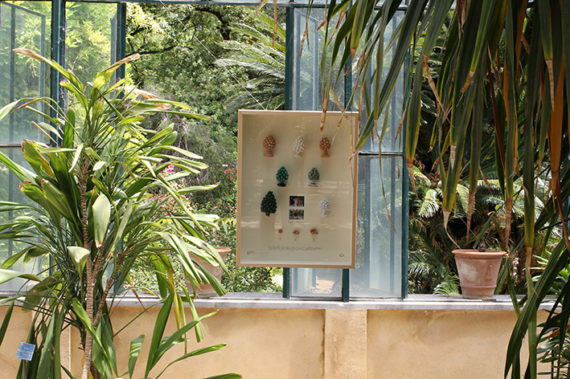 The ‘Garden of Flows’ strand is centred on Palermo’s Botanical gardens (worth visiting although the artworks here were overshadowed by the setting). Other works are dispersed throughout the city in smaller gardens and historical buildings including semi-derelict, formerly grand houses and churches. Some locations include a presentation of an individual artists work whilst others are more like small group shows. Overall the biennial feels manageable. Three days gave me enough time to engage in a fair amount of depth with the main programme. Having said this, I did not venture to projects at Costa Sud, ZEN or Pizzo Sella (all projects on the outskirts of the city 30mins-1hour by car) nor did I see much in the parallel programme disseminated in a long and fairly impenetrable list of exhibitions and events happening between now and November. Be aware that looking around Palazzo Forcella De Seta in particular takes time. There is 3-4 hours of moving image material here and though compelling, it does get quite draining (I split it across 2 days). 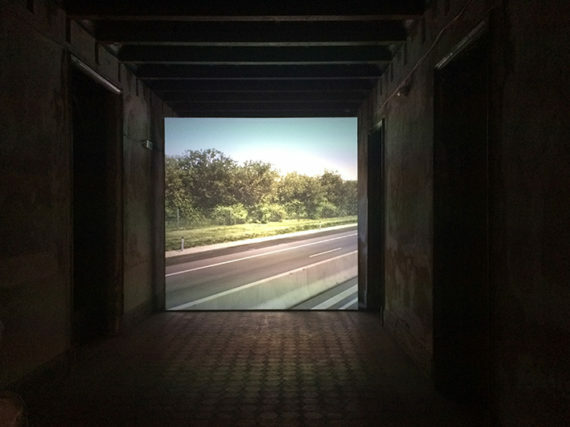 The other larger groupings of work at Palazzo Butera and Palazzo Ajutamicristo have a nicer variety of work with more sculptural installation pieces alongside moving image. On the whole the biennial is dominated by moving image and performance or participation based projects. Visiting Manifesta, you also get to see a lot of central Palermo, so the third strand of the biennial ‘City on stage’ could be taken almost as a condition of the biennial itself. 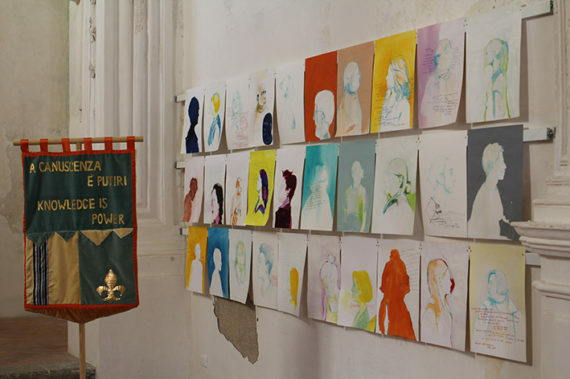 Works curated under this heading include parade works by Jelili Atiku and Marinella Senatore and a confetti cannon in Palermo’s Quattro Canti – baroque square – by Matilde Cassani; fired once a day during the opening weekend. Though I made some effort to see all three, bad time planning or getting lost meant I missed them. The piece I enjoyed most from this strand was Jordi Colmer’s ‘New Palermo Felicissima’ (2018). A guide leads small groups on boat trips and along the coast, and it gradually becomes apparent that the groups know more about the location than her. Whether the information the guide gives about each location is true is unclear. At times she relays lines fed to her though an ear piece. The work was funny – some light relief in a serious exhibition – and it resonated with the tourist experience of trying to make sense of a new place. ‘City on Stage’ suggests a show, a presentation of the city for visitors. But it has a second aspect too, more to do with re-presenting the city to residents themselves. The biennial began with an urban research study, published as ‘Parlermo Atlas’ – “an interdisciplinary investigation of the city covering architecture, archaeology, anthropology, archival research, personal histories and media.” Part of its intent is to ensure a long-term impact from Manifesta 12. 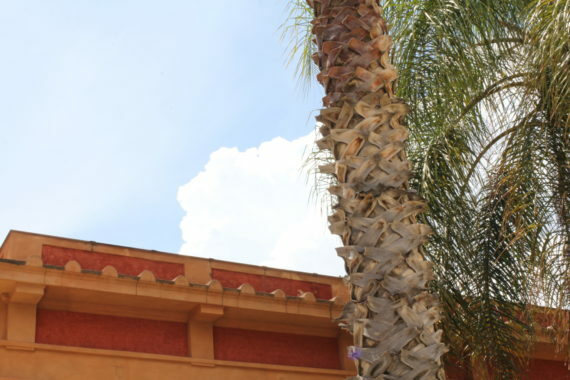 Some of the ‘City on Stage’ projects are geared toward collaborations with existing projects in the city and in the biennial more widely an education programme and parallel events aim to support Palermo’s existing communities. The effectiveness of this is hard to gauge on a short visit and maybe won’t be known until a while after the event. Eva Rowson thoughtfully discusses some of the questions arising about the relationship between a biennial and a city’s existing inhabitants in her Manifesta review. Suffice to say, by way of concluding this part, its an ambitious biennial and the three strands – though a bit confusing at first – did help me to make sense of the work. For me there wasn’t any really stand-out pieces that made me think “wow, that’s fantastic, the best thing I’ve ever seen,” but there was plenty of good work (my favourites are listed below). Moreover a lot of the artwork worked together, forming connections or stories that influenced one another. As such the biennial worked as a coherently curated show. It was relevant to its location and the city of Palermo added to the experience and richness of the work. • Fallen Fruit ‘Theatre of the Sun.’ (2018). (For sheer visual pleasure). • Fillippo Minelli, ‘Acoss the Border,’ (2010–ongoing). (Make sure you read the slightly shoddily presented but worthwhile accompanying A4 booklet, explaining each contributors design). • Lydia Ourahmane, ‘The Third Choir,’ (2014). (Ditto, read the accompanying file). • Forensic Oceanography, ‘Liquid Violence’, (2018). (More on this above and below). • Cristina Lucas, ‘Unending Lightening,’ (2015-ongoing). (Takes a while to get into but it’s pretty moving – and saddening – once you do). • Yuri Ancarani ‘Lapidi,’ (2018). (I liked the interplay here between 2 vertically displayed flat screen TVs). • Jordi Colomer, ‘New Palermo Felicissima,’ (2018). (For humour again, and nicely presented). 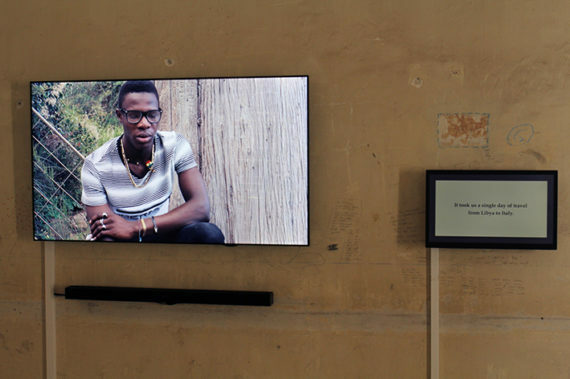 A short film shown in Laura Potras’ installation ‘Signal Flow’ (2018) documents the interactions of migrants, housed at a reception centre in Sicily, waiting to hear if they can remain in Europe. During the day residents can come and go relatively freely (though options for where to go seem limited). Footage shows residents climbing over the centre’s boundary fence to hang out on a nearby road; passing the time dancing, playing football and – in one instance – getting measured for some clothing. In the front seats of a car and on some plastic garden furniture two middle aged white people (Jehovah’s witnesses I think) read passages of the bible with mainly young black people in a troublingly didactic fashion. I find the film touching for a number of reasons. It shows friendship, and some conflict, emerging in imperfect circumstances. It gives a glimpse into the mundanity of the reception centre yet shows inhabitants doing their best to make a life there. They are not just migrants but individuals who sing, dance, get bored, make friends and want to learn. Still the work prompts a conversation with a friend – artist and filmmaker Lucy Barker – about the ethics of representing potentially vulnerable people as the content of art. Is there a risk that the artists are like the Jehovah’s witnesses, thinking they’re doing good but actually using people for their own agenda? There’s a tension inherent in making work that on the one hand could have an awareness-raising or advocacy aim but on the other plays a part in forming an artistic identity or furthering an artistic career. I wondered, then, what strategies do the artists in Manifesta 12 use to deal with this tension? Returning to the question I posed in Part 1: how is it possible to adequately represent migration in art, and what’s the purpose of doing this? Many of the artists in the exhibition use documentary conventions. ‘Talking head’ interviews crop up a number of times, most straightforwardly in Erkan Ozgen’s ‘Purple Muslin’ (2018) which is comprised of interviews with refugee women from Northern Iraq. Also in sections of a film representing The Peng! Collective’s ‘Fluchheifer.in.Become an Escape Agent’ (2015) which sits oddly between appearing as a documentary or promotional video for a project that invited German citizens help refugees and migrants enter Germany. I presume that the interviewees – purporting to be migrants and ‘Escape Agents’ – are actors (both because of the manner of delivery and the need to protect real participants). Perhaps they are working with real testimony and re-voicing it, but it’s hard to be sure. Documentary conventions are frequently undercut. 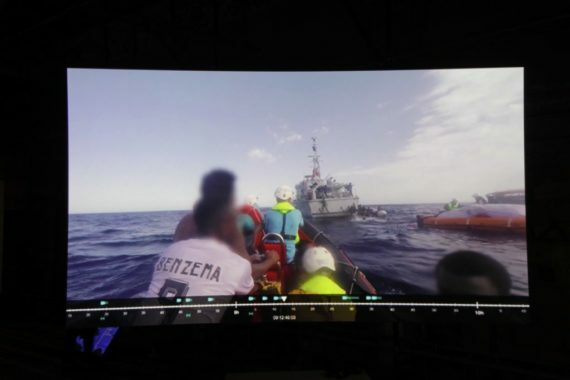 In a section of Uriel Orlow’s ‘Wishing Trees’ (2018), to-camera interviews with three young migrants from North Africa are displayed on large flat-screen TVs with English subtitles on a smaller, adjacent screen. Why are the subtitles separate? – necessitating a slightly awkward act of looking back-and-forth between text and image. What if I miss a word or gesture and fail to see the whole story? The structure of the work built in an awareness of partial understanding and incomplete translation of another’s experience. 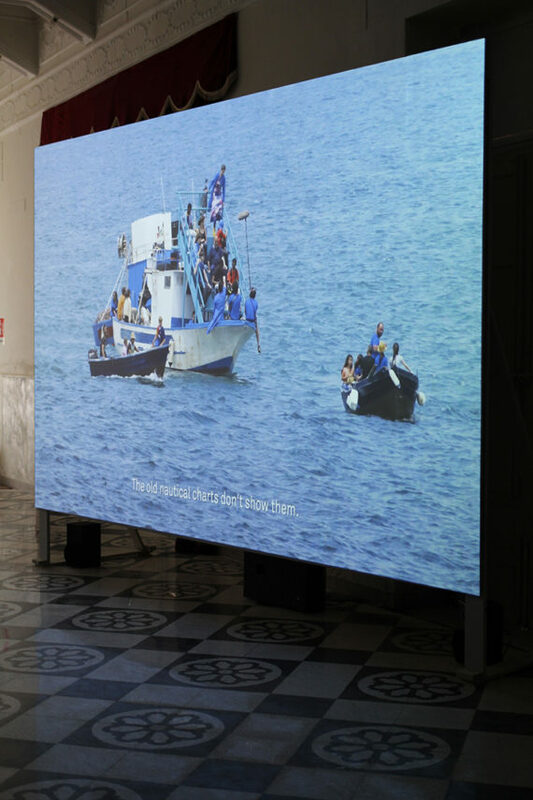 Notably too, Orlow’s work shows the migrants beyond their most vulnerable point. At least partially settled in Italy, a further screen shows them working as chefs in a Palermo kitchen. 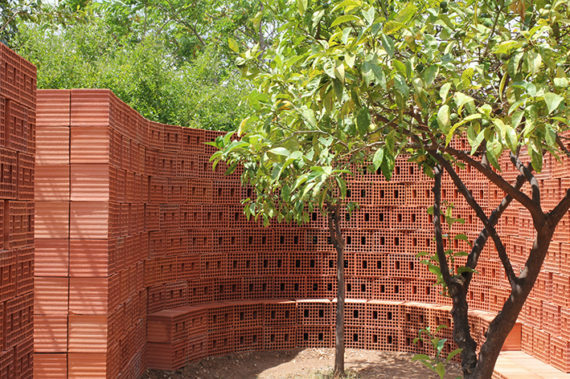 Moreover their testimony forms part of a wider work that uses 3 trees to connect divergent stories into a constellation that is not specifically about migration but about struggle and recognition. One ‘truth effect’ of documentary imagery arises from its use of photographic media, with recorded footage taken as evidence of events that occurred in front of the camera. This is addressed, in part, in Kader Attia’s ‘The Body’s Legacies. The Post-Colonial Body,’ (2018) (a film plus small sculpture made from a cracked piece of wood). The film is constructed around interviews with four protagonists described in the exhibition blurb as: “descendants of colonised people or slaves.” I only watched around a third of the 60 minute film so cannot give a full picture, but in one affecting section the philosopher Dr Norman Ajari discusses the role media images play in anchoring events in the public imagination. Specifically he deals with surveillance camera footage showing police beating up Théo Luhaka – a young, black, French man. For Ajari the footage shows an instance of police brutality and this seems patent here. Yet Ajari discusses the possibility that viewers may draw different conclusions. Some will see the police response as proportionate following the police account that Luhaka started the altercation. Ajari’s point – as I understood it – is that to challenge or re-frame erroneous interpretations of events it’s important to recognise what they are founded upon. To simply censure an individual whose beliefs you disagree with is less productive than addressing the conditions that led to their view. 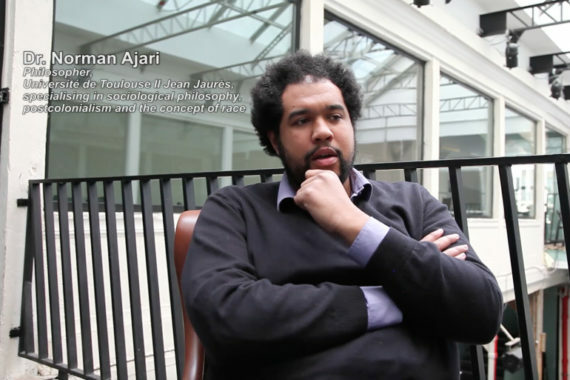 I didn’t catch everyone’s names but think that each interviewee (like Ajari) holds a position as an intellectual or cultural commentator in France. They switch between reflecting on their individual experiences and wider societal analysis. Shown as straightforward talking-heads,part of me felt that the critique of representation given in interview comments could have been extended to the visual presentation of this work. At the same time another part of me recognised the importance of seeing non-white commentators as such talking-heads. This need was emphasised by other interview comments discussing how black bodies – when depicted on screen – are often represented as soiled or degraded. I remained unconvinced, however, about the filmmakers decision to include some of the surveillance camera footage of the attack on on Luhaka. It could be argued that the footage is already widely circulating. But showing it again felt like a further violence. An alternate approach – of absenting the body – is taken by John Gerrard in ‘Untitled (near Parndorf, Austria)’ (2018). Gerrard created a detailed virtual portrait of a non-descript section of motorway, as seen by the artist on 29 August 2015. The location was in fact the site where the bodies of 71 migrants had been found 2 days before, suffocated to death in the back of a lorry. The tranquil and slick image becomes loaded once its significance is known. The work is conceptually clever – computer rendered but seeming to be a detailed, filmic document. It made me think about the inadequacy of visual representation, of what should or shouldn’t be seen and about how images construct certain realities. But, the cerebral aspect of the work made me uncomfortable and I can’t entirely sort my feelings out about this piece. It lacked the affective, human aspect of works that included first-person testimony and I can’t decide if my discomfort results from the fact of the migrant deaths themselves, or from their artistic treatment. Making visible is important but it is tricky. Representations are contested, partial and incomplete. There’s no guaranteed way to depict suffering and death in a manner that respects individual experiences whilst making them legible to the wider world. Still, the artists try. Artists in Manifesta use various strategies to highlight that visual (and verbal) language is not transparent. They use documentary strategies but trouble them, though spatial arrangements or unexpected combinations of material. Sometimes they use perspectival shifts between individual experiences and broader situations and in some cases too foreground the position that is being spoken from. A final couple of artworks I want to talk about take on this challenge, of making visible in order to make debatable. They do so by working to situate or aggregate specific events within wider social processes. Forensic Oceanography’s ‘Liquid Violence’ (2018) involves tracking and quantifying instances of migrant deaths in the Mediterranean (they count 16,173 deaths from 2011-2018). As in Gerrard’s work they represents particular incidents where hundreds of people lost their lives. For example, telling the story of a migrant boat that sank in 2016 after colliding with a container ship, King Jacob, that responded to its distress call (800 passengers are thought to have died, with only 28 saved). Yet where Gerrard’s work risks coming across as a bit flip, their work feels deeply earnest. They work actively toward accountability for the deaths of migrants, mobilising survivor testimony and surveillance technology to reconstruct events. In the case of the King Jacob, Forensic Oceanography suggests that the cessation of a proper search and rescue operation off the coast of Libya led to the use of this unsuitable merchant vessel, and this failed rescue attempt. Forensic Oceanography’s work is information-dense, it takes effort to engage with. I won’t remember all of the facts included, I could not take them all in, in the first place. But it has shifted my frame of reference. 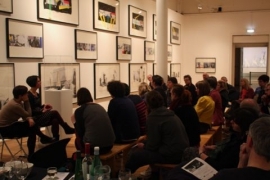 Viewers are encouraged to understand individual experiences as part of a wider picture. A sunk migrant boat is not a one off tragedy, but a result of social and political policy. Policy that could be changed. Re-framing individual experience in light of wider circumstances is central to Lydia Ourahmane’s work too (though her language is sculptural and part-autobiographical). ‘The Third Choir’ (2014) – an installation of 20 oil drums, each empty except for mobile telephone tuned to an FM radio transmitter – creates an abstract, ambient, audio drone. The work, first encountered as a brooding presence, has a complex narrative that unfolds in an accompanying binder folder. The barrels are from oil company Naftal, supplier of international oil companies and responsible for 90% of Algeria’s annual income. Ourahmane had the barrels imported from Algeria (her native country) to Europe (she now lives and works in the U.K.). The movement of oil is contrasted with the strictures on movement of people (for whom the radio may provide a virtual means of escape) and art. Ourahmane writes that in the 90s during Algeria’s civil war, many artists, writers, musicians and journalists were murdered or fled when Islamist terror groups sought to stifle free speech. Today, under a fragile democracy, art is still tightly regulated for fear of its destabilising effects. In a further layer of intrigue Ourahmane funded this project with money she received from BP (part owners of Naftal) after being commissioned to create an original painting commemorating BP workers held and killed in a 2013 terrorist attack in the Western Algerian desert. So, as well as foregrounding who or what can travel freely and who, or what cannot, Ourahmane’s work raises questions about the inter-relationship between art, money, politics and business. 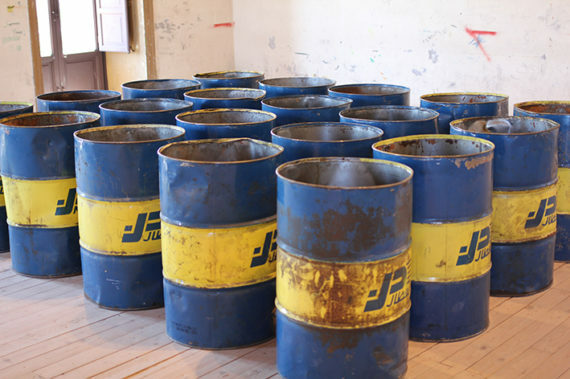 The indirect funding of the artwork by BP makes me think that negotiations about what art can represent, how and for whom are ongoing and always up for grabs. Art may be a niche pursuit, without mass-media impact but that doesn’t mean it doesn’t matter. 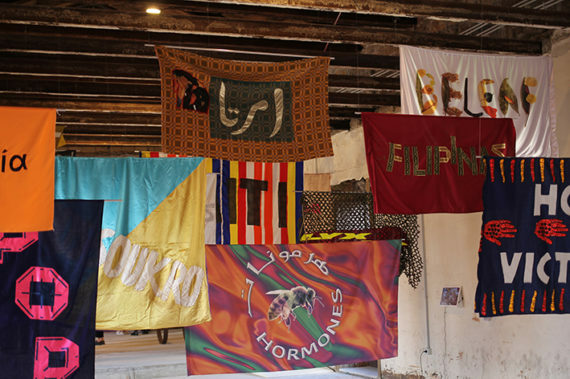 Art can be a bellwether, a kind of testing ground, and an event like Manifesta can be a place to try out thoughts, methods or strategies that may filter out into wider cultural discourse. Mayor Leoluca Orlando, speaking at the ‘Borderless Conference’ during Manifesta’s opening weekend, responded to a question about the role of art in our fast-changing world, where ideas of state, identity and homeland are coming under increasing pressure, Leoluca said that for him – as a politician – he can instigate change but it often happens slowly. Artists, he implored, can be audacious. They can create change right now. Their means might not extend to changing the material constitution of the nation state, but they can immediately create a change in the imaginary. They can propose new social configurations and shift how we see and how we imagine the world. That is his ambition for Manifesta and I’ve got to say that at an individual level at least it’s made me see things a little differently. T. Minh Ha’s article ‘Documentary Is/Not a Name’ was originally published in October magazine, I think. The version I accessed is from ‘Documentary (Whitechapel: Documents of Contemporary Art’) edited By Julian Stallabrass. 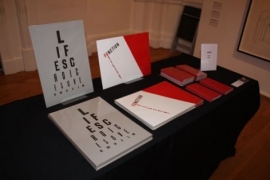 Recently I launched a new artists’ book ‘A Parlay’ at Leeds Art Gallery. The book is the outcome of a rather longer than expected project that I began just under a year ago. I’ve written about it before on my personal blog. To sum up, the content of the book came from a series of conversations I had with individuals at Leeds Art Gallery about art, value and about their own life choices, using the sculpture ‘Atom Body Was Light,’ 1964 by the artist Liliane Lijn as a stimulus and starting point. Conversation partners for the project included a masseuse, a theoretical physicist, a solicitor and an RE teacher. Their responses were edited and distilled to create a book which is a collection of short texts and typographic visual compositions. 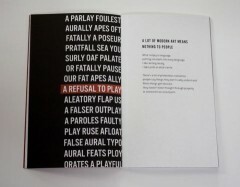 As well as the book I designed 2 new print works, printed by the The Print Project. At the launch event I had a bit of a light bulb moment whilst talking to the audience who came along. A few days before I had heard an episode of ‘One to One’ on radio 4 in which a Jewish woman who was a feminist but accepted a lesser role for women in her religious life interviewed an older woman about her views one the subject. She was using this older woman, an experienced lawyer and a very successful professional, as a proxy for exploring her own views. Suddenly I realised that the artwork I chose – Lijn’s sculpture – has been a bit of a proxy for my own work. Of course the work I have made for this project has a visual affinity to Lijn’s work because it has been influenced by it. However, generally speaking, I think there is some similarity between my visual use of text and interest in arguably slightly obscure or not immediately apparent subject matter and this particular object that Lijn made in the 60s. I wonder, have I been thinking about value in general? Or have I really just been wondering all along about the value of what I do?! I have been neglecting this blog since my bursary period ended, although my plan is to continue writing on here in some form. In the meantime I have been doing a little bit of reflection about the bursary and its outcomes. The key benefit of the bursary has been the opportunity it has afforded me to think about my work and to see this from different points of view. Of course it was the money that enabled this – allowing me to travel and meet people who I wouldn’t have done otherwise. – My mentoring relationship with Gill Park led to me showing some of my videos at Pavilion’s Christmas scratch night. Gill has also agreed to continue occasional mentoring meetings with me. – For the first time as an individual artist I made an application for arts council funding. This was rejected but I now feel confident about applying for this funding and will do so again. – Showing other people my work made me more conscious of how I present myself as an artist. I updated my portfolio, reorganised how I list my CV and most recently have updated my website (www.ameliacrouch.com). – I have become more confident at discussing my work with other people and find myself more actively seeking advice from those around me. I am also plotting a continuation of the type of meetings the bursary allowed, I am drawing up a list of curators and artists I would like to meet. The process has made me better at asking for this! – The series of meetings has helped galvanise me into getting on with and finishing certain projects. Knowing that you have a meeting coming up with someone provides a good deadline! I think this has been partially responsible for me making some new videos and book works I had been planning for ages. The videos have been exhibited in a few places already and the books will be having an outing at Leeds Artist book fair in March. – Getting the bursary has also made me open to other professional development opportunities, engaging with this type of thing more. I felt an element of validation from getting the funding and it has made me feel more part of a community of artists than just my local one. It is a difficult time to fund being an artist and the bursary process hasn’t given me specific answers or methods for sustaining a practice. However it has given me some new ideas, tools and new contacts. Moreover it has encouraged me to carry on, to feel part of a community of artists who believe in the value of creativity and who will persist! Amelia Crouch is an artist based in West Yorkshire.